All are very welcome to join us for the first of this term’s Screening and Discussion sessions, which will take place on Monday the 3rd of October, 5-7pm, in Jarman 7. We will be showing the silent French short Barbe Bleue (1901, George Melies, 9 mins) and the Hollywood production Bluebeard (1944, Edgar G. Ulmer, 72 mins). Continuing our focus on the Gothic, we turn to the fundamental Bluebeard myth. 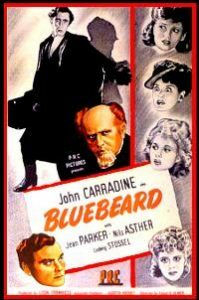 Melies’ short tells the traditional tale, while in the later film John Carradine plays Gaston Morrell, a Parisian portrait artist and puppeteer, whose models are mysteriously murdered by the violent ‘Bluebeard’. At the time,Trade magazine Motion Picture Herald’s review categorised Ulmer’s film as a ‘Class Melodrama’. It also opined that its return to the Bluebeard narrative (albeit an updated version) was a response to the ‘tawdry fripperies frothed up…under the guide of melodrama’ (by W.R.W, 14 October 1944, p. 2138). It therefore closely ties Melodrama, and not just the Gothic, to the Bluebeard folktale, placing this, favourably, within the context of contemporary Hollywood productions. Do join us if you can for these two films, as well as discussion about the upcoming term’s events.